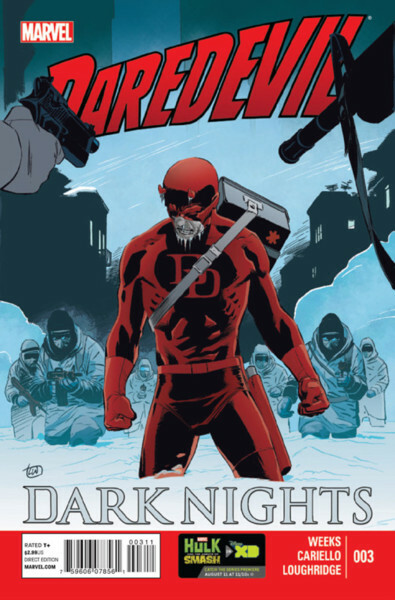 DAREDEVIL: DARK NIGHTS, an 8-part anthology title has just completed its first arc, "Angels Unaware", which was written and drawn by Lee Weeks. Here, Mr. Weeks and I discuss the story and some of the challenges of getting the arc completed. We also talk about why Daredevil means so much to him. Many thanks to Mr. Weeks for this opportunity, and I hope all of you enjoy the interview. Kuljit Mithra: We've been in touch off and on over the years, since the last time I interviewed you for the site. This story in DAREDEVIL: DARK NIGHTS has been a few years in the making, and I get a sense from you that it's been somewhat of a challenge. I know the character means a lot to you, so I wanted to know if it really was a challenge to get this done. Lee Weeks: In some ways, yes. And it's not a simple reason as to why -- it's not only one thing. I was not always able to work on it when I wanted -- there were other things going on, both personally and professionally. Of course, a big part of the challenge for me was to write again after several years of not doing it. So, it indeed was a challenge, at times, but something I completely love doing. It's one thing to solve the storytelling problems of another writer's story; it's a whole other thing to create those problems -- the puzzle, if you will -- to then solve. Writing and drawing also gives a lot more flexibility as the two disciplines can be tailored in ways that provide neat intersections of the two, the story and art. Mithra: In some other interviews at Marvel.com and Newsarama, you've mentioned your previous writing and art chores on the SPIDER-MAN: DEATH AND DESTINY mini, but after seeing the preview artwork, I kept on thinking of your work in the SHADOWS AND LIGHT book. Of the three (including the current DD story), which one did you feel has been "easiest" for you in terms of getting the right words down with the right art? Weeks: Probably the Thing story [from SHADOWS AND LIGHT]. It was a simpler story -- not as many moving parts. I mean, in some ways, ANGELS UNAWARE is a very simple story, but there are layers of complexity to the simple narrative thread -- more people's stories are being intertwined. And trying to keep the pacing in check so that the three issues play as a single night -- that was very challenging, too. One thing about writing -- which is also true for drawing, but I've found it much more so in my few writing experiences -- is that the script, like the art, is never done. What you do is decide when to stop. What I mean is, there is always something that can be changed, tweaked, or even rewritten. For instance, I must have read and reread the first script in part or in total at least 40-50 times -- possibly more. I don't ever remember reading the script without making a change. Sometimes the change is something very small -- perhaps the inflection changed in how I "heard" it in my head and I needed to fix it. I believe if I reread it another 40 times, I'd have a hard time not changing something with each pass. The temptation is great! Mithra: I brought up SHADOWS AND LIGHT, because it was published in b&w (and greytones). The setting of your DD story is a blizzard, so I was wondering if there were any thoughts of publishing this DD story without colour? Weeks: That's an interesting question, but no, that was never a consideration. I think we would have missed out on some of the key contrasts in the visuals. The blues bring a dimension of the cold temperature to the outdoor settings, contrasted against the warmer yellows and greens inside the hospital. Even more importantly, I can't see not portraying Daredevil's red (how's that for a double negative?). Maybe black and white with just the reds for his costume? The red in this story, in particular, also serves as metaphor for blood/sin/sacrifice -- contrasted against the white of the snow (purity/righteousness), which we see in the very first panel of the story. Mithra: Speaking of colour, Lee Loughridge was onboard for this arc. What was the most surprising/exciting thing for you to finally see the artwork like this? Weeks: I was really grateful that Lee agreed to do the job. And even more grateful for the time he put in making changes on some things to accommodate what I was looking for. We went back and forth a lot on certain scenes, most notably that first introduction to the blizzard in part one. Suffice to say neither of us made a great hourly wage on that one (sorry, Lee!). Mithra: Since you were doing both writing and artwork, how were you coordinating the flow? Did you write the script with details for yourself, or did you sketch out panels and fill in the blanks, so to speak? Weeks: The process was very much in a state of flux at all times. I have no step by step method, but would work back and forth from thumbs to notes on yellow legal pads, to typing dialogue for scenes... and then working back and forth between them all. The parts were worked up together as much as I could. I actually did breakdowns -- pretty tight breakdowns -- two or three different ways for several large chunks of the story. Much of parts 2 and 3 were redrawn completely... even though the essence of what was happening remained. Maybe there will be some deleted scenes in the DVD -- :). Also, I'm amazed how many times the right answer showed up at the last minute -- a shift in the pov of a scene that would cause a rewrite. There are so many different ways the same scene can be scripted. Mithra: Every Daredevil fan has their own reasons for why they follow the character, so what is the main reason you are drawn to him? And how much of that do you feel you got into this story? Weeks: Primarily, I fell in love with the character when Frank [Miller] was doing his thing. Then when he and David [Mazzucchelli] did "Born Again", it all hit a different level. There was something so real about him -- something so relatable. I am amazed that Frank was around 30 years old when he wrote that -- I've wondered where the words came from for him at such a young age. 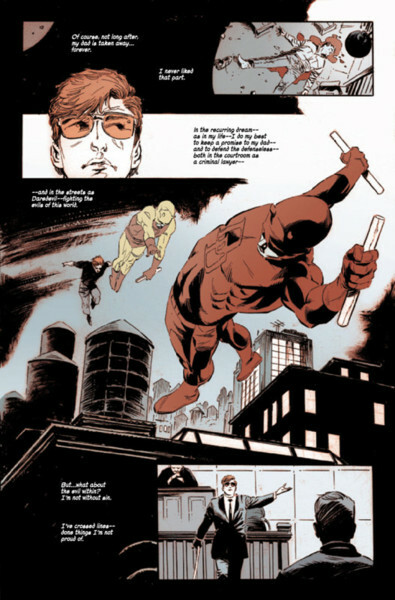 The element of Daredevil being sort of a character of faith was compelling, too. I say, "sort of", because I'm not sure how faithful he really has been (or has been written). In fact, this was one of the things I wanted to deal with -- Matt's own sinfulness. And, Matt is really representing all of us on that point. I'm just realizing something; I became a committed follower of Jesus Christ about a year or two after conceiving this story (that very early germ of an idea). I'm just realizing how different this story would have been if I'd written it back then. The years of walking with the Lord and studying the bible had an obvious impact on the direction the story took... at least in the scripting. 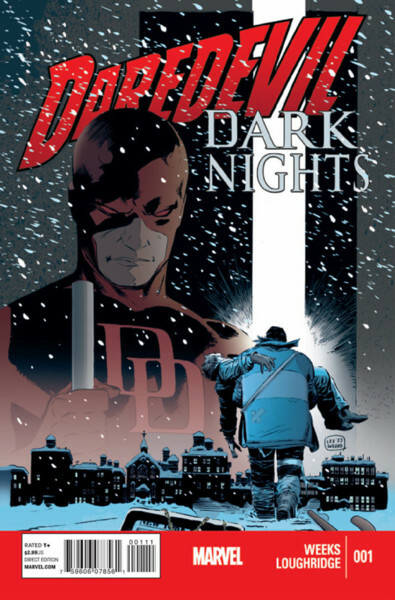 Mithra: In the interviews I mentioned before, you said you were not a big fan of the "darker" aspects of Daredevil stories since you were on the title. 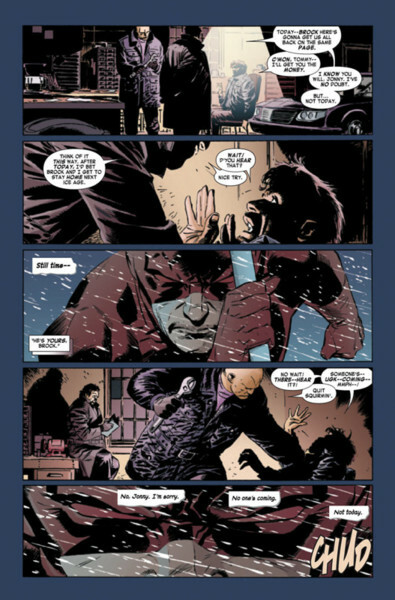 You had mentioned "Born Again", which has many dark elements to it... so I'm wondering if you mean the constant bad things happening to Matt Murdock without a sense of a hopeful future (like the last page of that story with Matt and Karen)? Weeks: Another interesting question; I've actually said that a lot about the ever-darkening tone of comics and the culture... because it's true! Yet, I've had people refer to "Angels Unaware" as a story with a dark tone to it. And, I suppose they are right -- which really makes your question that much more to this very point. I don't want to eliminate darkness from these stories, but it's exactly what you said -- I want to see more hope and light in the midst of that darkness. There is a difference between acknowledging evil and glorifying it. There are themes that never grow old for me; sacrificial love, redemption, perseverance, and the father/son relationship, among others. I think of darkness in relation to these themes, and it makes me think of a seed going into soil. The soil is made up of dark, dank, dead stuff. Really good planting soil even has manure in it. The seed may be small, surrounded by dead things, but it will grow in the midst of all that dead stuff. Mithra: Was the story always going to be 3 issues, or did you expand or contract the story as you worked on it? And had it always been planned to be a mini series, but it was included in this new anthology series? Weeks: It was always going to be three issues -- although I second-guessed myself afterward, wondering for a time if it shouldn't have been two. I'm glad it stayed at three, however -- I think it's the right length and allowed the right amount of massaging certain story points. Sometimes we can zip past things that could use a little marinating. Mithra: How had you pitched the story originally? Was it with a different set of editors? Weeks: Yes, it was with a different editor. The raw pitch actually sat in a drawer for a few years, but when Warren Simons left Marvel, he made a point to hand it off to Steve Wacker and Tom Brennan, telling them he thought it was something they should do. A real menschy thing to do! Mithra: Now that all the issues have come out, what is next? Are you interested in doing some creator-owned work? Weeks: One thing that happened as a result of this; Sergio Cariello and I will be working together a little more. I was just so impressed with how he inked me on the pages he inked in part 3. We're going to give the partnership at least a couple more shots. I'm very interested in doing some creator-owned project, as well. But, it has to be the right project. I have a few things in mind; we'll see what happens! For now, I'm doing a couple smallish things as I try to find that next bigger project.